23/48 Les Winan Significantly better than given credit for. Quality lost among crush of Affleck/J. Lo relationship. Deserved better box office and reviews. 41/126 Kim Hollis Not my favorite Kevin Smith film but that's faint damnation to be sure. Kevin Smith is acting his age. After writing and helming a series of talky, hilarious, youth-oriented films, the talented director who many devoted followers view as the voice of their generation leaps from effective puberty to near-middle age with Jersey Girl. 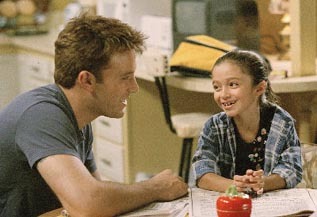 While it's been nearly impossible over the course of the past year to avoid Ben Affleck's mug on any number of magazines and television shows due to his tempestuous relationship with Jennifer Lopez (not to mention their theatrical disaster Gigli), many people probably fail to realize that it's Smith who helped to make the young actor a breakthrough. Before working with Smith on a number of consecutive films -- including Mallrats, Chasing Amy, Dogma and Jay and Silent Bob Strike Back -- Affleck's roles had been mostly limited to television movies and bit parts in projects such as Brendan Fraser's School Ties and the movie version of Buffy the Vampire Slayer. With his charming and memorable performance in Smith's underrated romantic comedy Chasing Amy, Affleck began to pave his way to Hollywood as a major force to be reckoned with. The same year, he won an Academy Award for his screenplay for Good Will Hunting, co-written with Matt Damon. It should be noted that it was one Kevin Smith who took that script to Miramax. So, love him or hate him, Affleck has done a lot of outstanding work with Smith over the years, and as the director takes on new, strange roles like fatherhood, his work is reflecting a more contemplative, adult viewpoint. From an evolutionary standpoint, that's a positive. Smith staples Jay and Silent Bob still have their place (and I say that as a real fan of all Smith's work, even including the generally reviled Clerks: The Animated Series), but this fresh reflectiveness only makes sense. It's not just Smith who is growing up, it's also his audience. Perhaps this is why the story and footage released thus far are so appealing. Affleck plays Ollie Trinke, a successful New York PR executive with a gorgeous, pregnant wife (Lopez). That all goes wrong when she gives birth to their daughter, as she passes away from complications during the process. Things get worse before they get better, though, and Trinke loses his posh job, forcing him to move to the New Jersey suburbs with his father (George Carlin, another Smith favorite). Trinke misses that old life a lot, but through the eyes of his daughter and with the help of a video store clerk (Liv Tyler), he realizes that it's okay to let go of that past and embrace what his life has become. The trademark Kevin Smith banter is pretty clearly present in abundance (if the trailer is any indication) and he maintains his trueness to his fanbase by including a couple of his regular performers in the cast. Jason Biggs, who played himself in Jay and Silent Bob Strikes Back, has a supporting role, and there are also cameos from Matt Damon, Jason Lee, and Smith's wife Jennifer Schwalbach Smith. As referenced, Smith and Jason Mewes -- and their counterparts Jay and Silent Bob -- are very notably absent. In the past, it has been these two characters (and most specifically Silent Bob) who frequently impart the biggest nuggets of wisdom in Smith's films. Needless to say, diehard Smith fans will miss them.